NOTE: This model has been discontinued but may be available as pre-owned. Please call for availability. 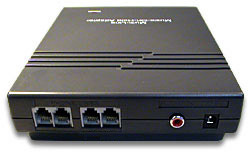 Other models of interest include the OHP6500. Please call 702.868.7676 for other solutions. MOH 500e Now ANY business can have on-hold audio. It used to be that only businesses with PBX or KEY phone systems could have on-hold audio...not anymore! The MOH500e has an integrated analog adapter module which allows it to provide your supplied on-hold audio content to ordinary analog and popular "KSU-less" phones, from 1 to 4 lines and up to 16 phone extensions. Plus, with the MOH500e you're free to choose your own audio source or one of our maintence free Digital Message On Hold players Please contact us with any questions.. The MOH 500e works just like the on-hold audio feature on big, expensive, PBX and KEY phone systems. Just push the HOLD button on any extension and our MOH 500e grabs the line and plays on-hold audio to it*. Your callers won't know it's not a big system! 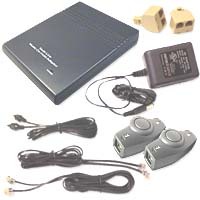 Connection is similar to connecting a telephone answering machine, so installation is essentially plug and play. The MOH500 works with virtually all analog and KSU-less phones and is activated by pressing the *hold button (see note below) on any phone extension. With the MOH500e, any business, regardless of its size, can sound like a corporate giant. 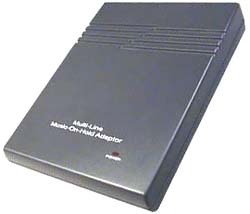 And with its standard "RCA Phono" audio input, you can supply audio from any source you like, from portable CD players to Digital players, and everything in between. Best of all, there are no moving parts to break or wear...non-volatile memory means it retains its recorded content, even after power failure. On telephone lines that include the Phone Company Feature "Call Waiting," only the caller your are talking to last when pushing your On-Hold button may listen to your message when placed on hold. When flashing between two callers without using your hold button, neither caller will hear the message because with the phone company "Call Waiting" feature, the hold condition occurs at the phone company office, not your office or phone. Hold button activation requires a TEHMA be present on the phone placing the call on hold. If activating via a cordless phone, either use a TEHMA with your headset, or place caller on hold by pressing the star key twice. Lean more about the TEHMA here. The MOH 500e unit may still work with with "Centrex" phone systems. If you activate your hold feature using the "Hold" button on the phone, this model should activate "Hold" and "Message On-Hold." If using the "Centrex" "Hold" or "Transfer" feature(usually by pressing a button sequence), your caller gets placed on hold at the telephone company central office (CO) and will not activate the MOH 500e. - Shipping Weight: Approximately 4 lbs.